Each year we see more and more campers bringing their beloved pets along with them on their camping vacation. 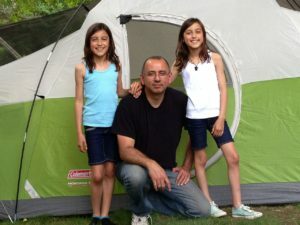 It makes sense that they are members of the family and will get just as much enjoyment out of camping as you do. There are a couple of things you can do to help them navigate their way around an unfamiliar campground for the first time. 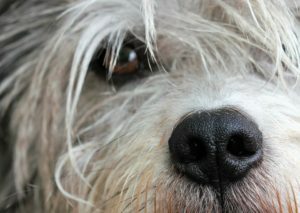 Keep them near you – They may be a little nervous when they see all the unfamiliar people and smell unfamiliar smells. If you keep them near you and try not to leave them alone on the campsite, they have a better chance of quickly becoming comfortable in their new surroundings. Bring prescriptions – Make sure you bring plenty of their medications, both over the counter and prescriptions. Have a few days extra on hand just in case you decide you’d like to extend your stay or take your time going home. Having an extra few days worth will come in handy. Food, Beds, and Toys – Bring as many of their familiar favorites from home as you can. It can be quite comforting for a pet who is nervous over their new surroundings to be able to snuggle into their own bed with their own toys. These small things should help you get the most out of your camping trip for you and for your pets. We look forward to seeing you here this year. We all appreciate tips that make our favorite things to do even more fun. These 10 camping hacks are tips that you may not have thought of, but you’ll find yourself using all the time! Make an inexpensive lantern or reading light by filling a gallon jug with water. Invert a head lamp so it’s facing the water and secure it to the gallon jug with the strap. The kids will think it’s cool and you can make it up in just a few minutes. Pre-scramble eggs for breakfast and pour them in a bottle (an orange juice bottle works brilliantly). 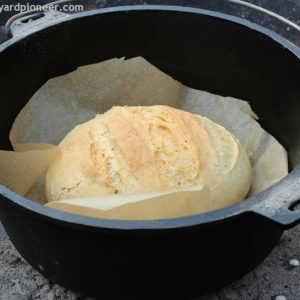 No more hauling eggs in a carton to the campsite, and worrying about or dealing with breakage and waste! When you’re ready to make breakfast, you just pour out the scrambled eggs and cook them as you usually would. If you’re not using a blowup mattress for sleeping, bring foam floor tiles. Sleeping with only a sleeping bag just got a LOT more comfortable! The tiles will keep you protected from the cool ground as well. Forgot to take your keys out of your pocket when you went swimming? Prevent them from sinking to the bottom of the lake by attaching a wine bottle cork to your key chain. Make your own port-a-potty with a five gallon bucket, camping toilet seat, trash bag and kitty litter. Who doesn’t love pancakes for breakfast? Mix up your pancake batter and store it in disposable cake icing bags, clipping them at the ends—when you’re ready to cook, snip off the end to create a tidy dispenser! 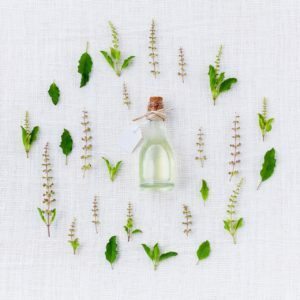 Create a mini medicine cabinet with a pill box; simply clip the paper labels from the packaging of every day OTC medicines, affix them to the lids of each compartment and take a few of everything with you. 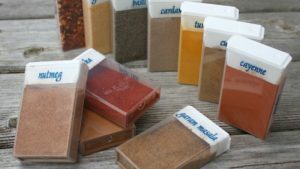 Recycle Tic-Tac containers to hold spices for cooking. Recycle a pill bottle by filling it with a cotton ball, band-aids, alcohol swabs, and individual antibiotic cream packets. Don’t want to use tons of matches? Coat a cotton ball with Vaseline and wrap in a square of tinfoil. When needed, cut an ‘X’ in the foil, pull out a bit of the cotton, twist it into a wick and light. It lasts long enough to get your kindling started. Camping with Pets is an enjoyable experience and we are seeing more of it all the time. You little fur-kids make the whole trip a joy when you’ve planned ahead and for the unexpected. Be sure to carry a copy of their vaccination records with you. If something comes up and you have to take them to a Vet while traveling, you won’t have to rely on your memory and your pet can get the care it needs in a hurry. Bring plenty of their medications. Try to stock extra, just in case. You never know when that road less traveled will call you to take a side trip and you don’t want to run out of their meds in an unfamiliar place. Some people find it helpful to put a sign on their RV that there is a pet in residence. Campgrounds are a friendly place and that can be intimidating for a shy pet. It’s helpful to warn others there is a pet inside your rig so they don’t accidentally open the door and let your little one escape. We know you love your pets and we love that you bring them with you. We are looking forward to seeing you walking around the campground this year. In case you hadn’t noticed, thunderstorms can make the most calm canines become filled with anxiety. It is frustrating when this happens and you have no idea how to react. The next time a storm is headed your way, use all of the following tips. Play some calming tunes. One of the most frightening parts of thunderstorms are the booming claps. You can stop this from taking control of your dog’s emotions if you drown them out. Head to a part of your home that does not have many windows and drown the sound out with soothing melodies. This will stop your pooch from being startled every time there is a loud sound. Never leave your dog alone when you know that a storm is coming. This might seem like an inconvenience, but it is your responsibility as a pet owner. If you have to head out, place them in a carrier or crate and cover it with a thick blanket. This will prevent them from seeing all of the things they find so startling and it will provide a bit of a buffer from the noise. Attempt to desensitize them to the sounds. 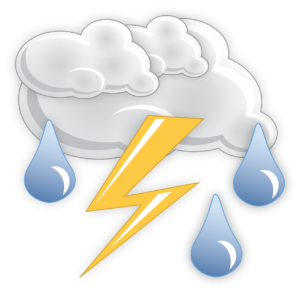 Head to a site like YouTube and play videos that depict thunderstorms. Put them on at a fairly low volume for short spurts of time. As your dog listens, offer them treats and praise. Gradually lengthen the time you play the video and the volume until they seem to be unfazed. There are people who are frightened at the mere thought of thunder, so it should not be surprising that this is something that can affect canines. Preparing yourself and adhering to the guidelines here should help you keep your dog calm the next time a storm rolls your way. There’s nothing like spending time with family and friends, camping and enjoying each others’ company. 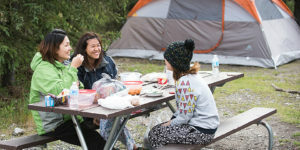 You get the chance to catch up with each other, spend quality time together, and reconnect for awhile.Your experience will be a good one and so will your camping neighbors’ when each of us follows a few simple rules of camping etiquette. Arrive early. Try to arrive before dark, if you can. Setting up in daylight will be much easier for you and you won’t risk waking those campers around you who have already gone to bed. Keep it clean. Run a sweep of your campsite at least once a day to pick up any paper or food wrappers that may have fallen on the ground. Put all food away each evening before going to bed for the night. Be friendly. You’ll be surprised how willing campers are to talk to you if you strike up a conversation with them. You all have one big thing in common, you love camping and sharing stories is half of the fun. Leash your pet. It’s better for everyone when you keep you pet on a leash at all times. Campgrounds are known for having a lot of running kids, bicycles, and new smells that can tempt your pet to run. They will be safer in your care, safely leashed. Be sure, also, to clean up after your pet. Bring bags with you as you walk the campground so you can remove their waste as it happens. Watch for boundaries. Your neighbor’s campsite is their home for the duration of their stay so be careful of walking across their lawn. Make an effort to keep to the roads and everyone will be fine. These are just a few things to enhance your camping experience and that of your camping neighbors. We look forward to meeting you so be sure to say hello if you see us in the campground. Camping is possibly one of the most effective means for families to take pleasure in each other’s company, away from the schedules of every day life. It does require some planning and preparation, but every minute you invest with your family members will be worth the effort. If you keep it simple and bring along the basics, you’ll have a wonderful time outdoors and you will not miss out on any of the activity at home. You and your family can enjoy a memorable experience of camping together while everyone is still living at home and hasn’t gone off to college or started families of their own. Depending on whether you are planning on camping in a tent, an RV, or a cabin, your camping list will be unique. Take each person’s preferences into consideration when you make your decision. Modern dome-style tents can easily accommodate 3 to 4 people, with bigger ones being able to fit as many as 8. Due to the fact that you only have to connect a couple of pieces, dome camping tents can be set up very quickly and then you’re off to play in the campground. If you do utilize a tent make sure you spray it with some rain-resistant spray to stop leaking in the event it rains. A tarp underneath the tent provides additional security from moisture and sticks or stones. RVs and cabins provide more comfort and protection from the weather. They are roomier but come with their own set of work to maintain. You can sleep in a soft bed, it’s easier to cook inside, and there is room to store supplies. You’ll probably have a fridge and a heater as well. Some people prefer them while others would rather camp in a tent. Camping is a very individual issue depending on people’s preferences and experiences. Pack lighter than you may think necessary. A four-day trip, for instance, requires just a few sets of garments. You’ll most likely need just a jacket, a sweatshirt, 3 or 4 shirts, a set of trousers as well as shorts, socks, underclothing, and also an extra pair of shoes or sandals. Bring along a pair of trekking boots if you intend on hiking any trails. You’ll be packing for every member of the family so keeping a list of what has been packed and what is still needed will help keep you organized. Prepare your food. Obviously you can bring coolers along but we recommend bringing foods like nuts, bread, and cookies, anything that does not need refrigeration. 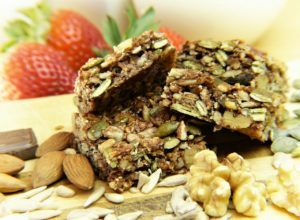 Kids will want to eat all the treats at once so stretching them out over your trip will keep them from getting a tummy ache. Keep your food choices simple. Hamburgers and hotdogs are camping favorites. Much of what you plan to bring can be prepared ahead of time and placed in food-safe containers. It will save you time for more play and less work while you are here. It’s a great time to bring out the board games, a deck of cards, or lawn games you know the kids might like. Pack any favorite toys, especially the ones your kids like to sleep with. It will help comfort them at night if they feel a little anxious when the lights go out. Add extra batteries to your list and more flashlights than you think you’ll need. They tend to get lost or used for fun after dark. It’s good to have a schedule but be prepared for that schedule to go out the window from time to time. Kids may sleep later than you expect or want to swim longer than you’d planned. You can zig when they zag and enjoy the lack of a planned schedule for the day. Either way, the best part is being together. Your kids will be talking about the trip many years from now when they consider camping with their own little ones. Let yourself enjoy the chaos and take lots of photos. There is plenty of time to get back to a normal routine once you are home. We hope your trip is memorable and that you come back to camp with us many times over the coming years. We look forward to seeing you and watching you have an absolutely wonderful time camping with your family.